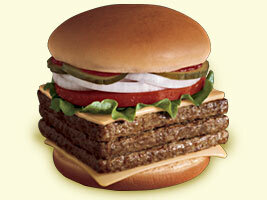 The thing has 970 calories oozing out of the three quarter pounds of processed beef, and 59 heaping grams of fat. Hamburger Bliss™ indeed. I haven't actually eaten this burger... and in fact, I don't know if I've ever had a Wendy's burger (those square patties freak me out), but just seeing the thing on television makes me want to hurl each time I see it. I feel greasy and lumpy just thinking about it. Bleah.